Many lives are forever changed since one man set foot on a Sequim animal sanctuary. 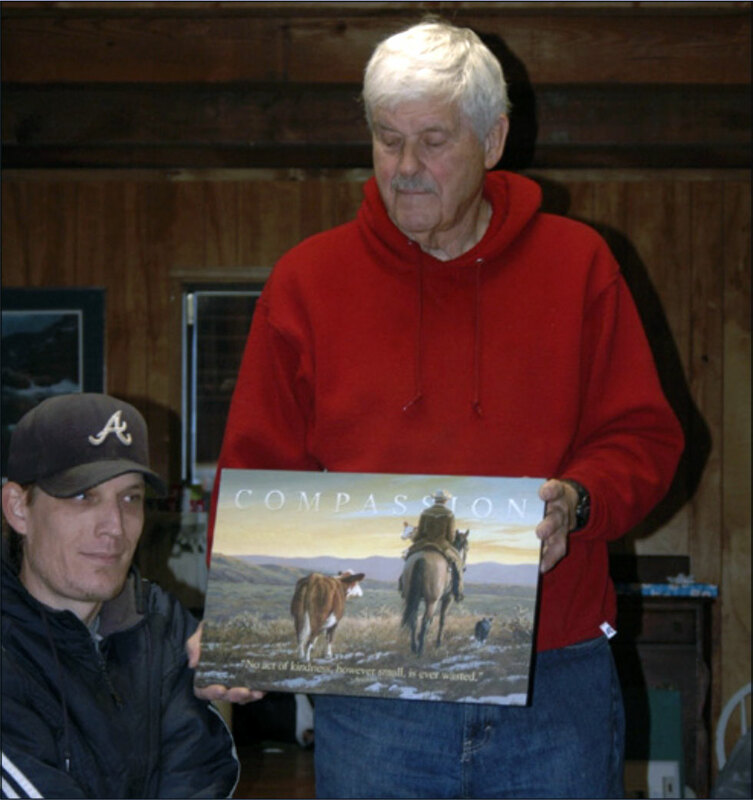 To acknowledge the devotion, work ethic, but most importantly the intrinsic compassion of Ken Harada, a volunteer at Precious Life Animal Sanctuary, the sanctuary’s owners and founders Caryl and Ralph Turner honored him with a “Compassion Award” on Dec. 14. Since he first began volunteering at Precious Life Animal Sanctuary about two years ago, Harada has returned nearly every other day to help. His responsibilities have grown and easily extend into every facet of the sanctuary from maintenance to caring for the animals, but Harada’s personality is illuminated most by his compassion and appreciation for life. Harada is a tall slender man in his 30s. He has bright eyes and a warm, gentle smile. Beyond words like “kind” and “compassionate” Harada is described by the Turners as “quite, humble and almost painfully shy.” However, when caring for a previously neglected or abused animal, whether it be a cow, rabbit or pig, he has a sense of awareness and insight beyond most, Ralph explained. As Harada has continued to volunteer at Precious Life Animal Sanctuary, he’s helped to extend and better a variety of animals’ lives, as well as enrich the lives of all those that work around him, Ralph said. In addition to Harada’s genuine and subtle way with the 100-plus animals at the sanctuary, he’s able to physically keep pace with the demands of 85 acres. “It has gotten to a point where I don’t know what we’d do without Ken,” Ralph said. For the past 17 years Ralph and Caryl have worked “every waking day” to mold their property into the sanctuary it is, Ralph said, but as they age the importance and value of volunteers like Harada are greatly highlighted. Ralph recently underwent knee surgery and because of complications wasn’t able to work on the sanctuary for about four months. Without Ralph, Caryl looked to Harada to help maintain the sanctuary and the many lives it supports. Other longstanding and much appreciated volunteers of Precious Life Animal Sanctuary include Elaine Miyabara, John Mash, Morgan Boudrou, Debbie Drake, Reed Mathis and Gordon Peterson.